This may complicate Dynapower’s relationship with Tesla. But it positions Dynapower and Samsung well in the emerging commercial market. The energy storage supply chain is undergoing a bit of a shakeup. Leading battery storage producer Samsung SDI is teaming up with leading storage inverter maker Dynapower to develop an all-in-one storage solution for commercial and industrial customers. It's a move that the companies say will remove intermediaries, lower installed costs, and encourage a broader use of behind-the-meter batteries. The Samsung-Dynapower storage line includes a 250-kilowatt/550 kilowatt-hour system that will utilize Dynapower's MPS bidirectional storage inverters and Samsung's E2 batteries. They also plan to release a smaller 2-hour/100-kilowatt system soon. The integrated system is meant to "flatten" the supply chain, said Chip Palombini, the sales and marketing manager for Dynapower's storage group. According to Palombini, system integrators (à la Stem, Green Charge Networks, Advanced Microgrid Solutions) are starting to "step to the side in the taxonomy" in order to focus on customer acquisition. They're much less focused on hardware, and are looking for partners that can simplify integration. "They're looking for a turnkey product," said Palombini. It's also good for the end customer. By the time batteries, power electronics and components are sourced by multiple intermediaries, the cost markup could be between 20 percent and 40 percent. "The market needs a flatter supply chain," said Palombini. It also complicates relationships a bit. This doesn't necessarily mean that Dynapower will stop providing inverters to Tesla, if the company needs them for projects. But it does put the two former partners squarely in competition with one another. Samsung SDI and Dynapower have been working together on projects for some time. The two partnered up to serve the Electrical Training Institute's net-zero building, Duke Energy's 36-megawatt/14-megawatt-hour Notrees battery-wind hybrid project, and already have "several" projects in the works for 2017, including one at the University of Minnesota. 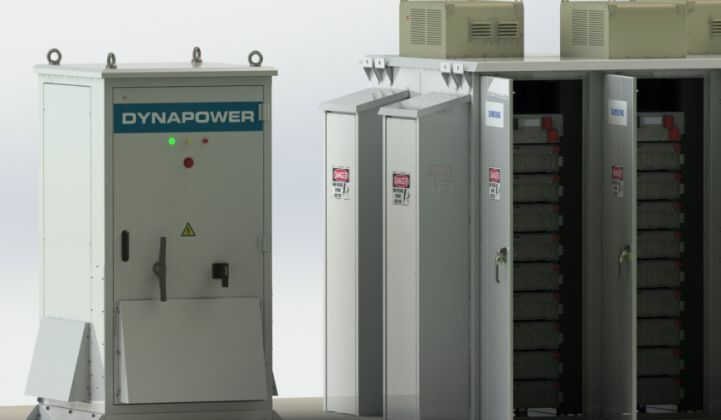 According to Palombini, Dynapower is also a big believer in using storage for backup power -- currently a rarely cited selling point for C&I battery storage systems. According to research from the Lawrence Berkeley National Laboratory, the C&I sector accounts for 98 percent of the cost of power outages. 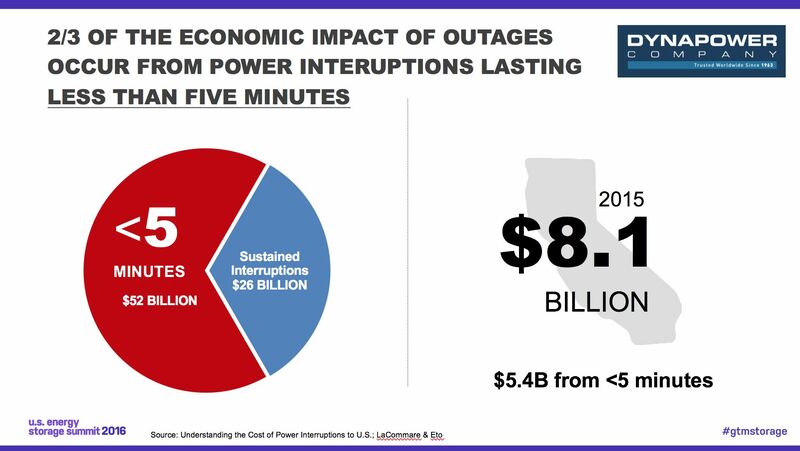 And two-thirds of those outages are less than 5 minutes in duration. The MPS product line features a "dynamic transfer algorithm" that monitors events on the grid and switches the inverter from grid-connected mode to standalone mode within 16 milliseconds. Dynapower thinks C&I storage projects can operate more like UPS systems, as well as providing demand-charge management services. "Outage prevention should be a value proposition," said Palombini. "It's pretty compelling. When you have these projects going in at a quarter-million dollars, for less than 10 percent [more], you can provide backup." Dynapower President Adam Knudsen is presenting a case study at GTM's storage summit this week about this exact topic. Below is one of his slides. Ravi Manghani, director of GTM Research's storage practice, said that backup power is emerging as a compelling C&I solution as battery costs keep falling. "Power quality has been an application for a while now, typically served by UPS systems. But now we are at a price point where lithium-ion can go head-to-head with traditional batteries -- changing the duration and adding other benefits from daily cycling, if needed." We're talking about storage all day for two days straight at GTM's Storage Summit. Squares get access to all the sessions in real time and in our archives.